Informed by his multicultural background and his obvious girth, Bruce has been making people laugh since an early age. He has a cheeky and vivacious comedy style which has been appreciated by comedy audiences in the UK and internationally. This man is going to be huge! At the outset of his career he was a semi finalist in Channel 4 So you Think You’re Funny in 2004 (turns out he was) and BBC Talent in 2005. In 2014 he was named the Scottish Comedian of the Year. Bruce has performed for most of the larger comedy clubs up and down the country. He has also performed in more traditional settings for company Christmas parties, large festivals and corporate dinners, as well as theatre tours of his own one man shows. He's ever starred in panto! Bruce runs and comperes his own 'Just Laugh' comedy clubs, giving him a wealth of compering experience from Stornoway to Abu Dhabi. In addition to this he has compered for metropolitan clubs and has a wonderful ability to engage an audience. "Bruce Fummey had the crowd belly-laughing in seconds..."
With numerous Edinburgh Fringe runs under his belt Bruce is now a regular fixture in the Fringe calendar with shows that have an educational slant as well as being laugh out loud funny. 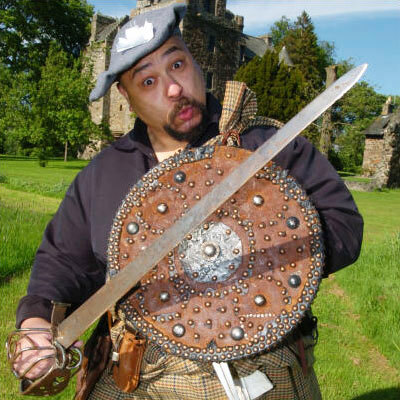 Shows have been about Robert the Bruce, learning Gaelic, his Afro Celtic and more. Fringe runs has been followed by theatre tours to growing audience numbers and venue locations. 'The Greek the Apple and the Time Machine' brought humor to the history of physics. "Has a sharp stand-up brain and thumpingly well-delivered, this superbly-crafted script explains complex theories in easy-to-understand similes and tops off each explanation with beautifully-timed comic punchlines..."
This was followed in by his sell out show About Tam O’Shanter. "His sideways glance at Robert Burns' most famous poem is simply and purely hilarious, his research is deep, his timing spitsecond and his ad-lib ability amazing..."
Bruce managed to top even this with the show 'About the Jacobites' winning critical acclaim as well as effusive praise from audiences. Funny, funny, funny; and that's just his attire. Girls are just drawn to the big man in his kilt. I have never seen so many women in the front row smile due to their allocated seating! Bruce loves comedy, and the audience love him. 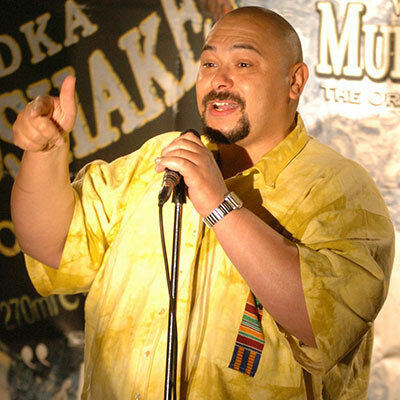 Quick witted and very professional; he was a great ingredient to make a fun filled night of comedy for everyone. "Bruce Fummey, whose easy delivery and original material produced the first real laughs of the night"